I had a goal to read 65 books this year. When I recapped the first half of the year, I was a little worried because I was only up to 30. But between taking a three-week blogging break and reading some quick reads (shhhh), I managed to read 38 books during the second half of the year, which brought my total up to 68. Maybe 2016 will finally be the year when I break the 70 mark. Ramona is in fine form, and Henry takes it all in stride (except for the part when she locks him up in his own clubhouse--then he kind of loses it). A little more serious than some of the other Ramona books. Having your dad lose his job will do that to a story. I appreciated that he treated stuff as stuff rather than faithful companions, but his actual outline for purging got a little repetitive and tedious. This book totally transformed my attitude towards The Princess Bride from indifferent, maybe even a little cool, to devoted fan. Also, the audio version is a must. The metaphor was a little overdone in this short book, but it made us plant a moonflower in our backyard and the flowers really do open up extremely quickly. A design book about living with kids that makes you think the author must have actually lived with kids (she does, in fact, have six of her own). A book about books and the unpredictability of life. Told in sparse but mesmerizing language. A poignant story that surprised me in a dozen delightful ways. My kids enjoyed this book far more than I did. If you're looking for a good book club book, pick this one. Pippi gave us plenty to laugh about. She's one of a kind. My favorite of the trilogy, and it has a good nail-biting scene at the end. My kids are still singing the song about Boggis and Bunce and Bean. I liked it, but I think I'd be praising it a lot more if I actually enjoyed post-apocalyptic fiction. Really loved the way this story was told--with the events of the past eventually colliding with the present. I like happy endings though. The parable of the bicycle, which has made this book so well-known and loved, was not worth reading this book for. Other parts, however, were. What can I say? Harry Potter is casting his spell on a new generation, and my kids are included. I started out being completely fascinated by this book, but by the end, I was completely disgusted. Two thumbs down. This book has one of the best twists I've ever read. In spite of a good 100-page run in the middle, the beginning was too confusing and the ending was too horrific for me. My kids love a despicable villain, and Miss Slighcarp is one of the best (i.e., worst). Mma Makutsi gets the gold star for this book. She basically saves two businesses and then solves a mystery in her downtime. Cute story, but I'll probably have forgotten most of it by next Halloween. There are things I could complain about (and I do in my full review), but overall I loved this creative spin on The Jungle Book. I searched (and searched) (and searched) for a short stories collection that I would like and finally struck gold. Witty, with a touch of the morbid. Probably the book I talked about and recommended the most during 2015. Dominic's adventurous spirit and positive attitude are contagious. If you think you can't find parenting advice in fiction, read this book. I read this book because Aaron was reading it, and I enjoyed it just as much as he did. I couldn't get a single new fluffy Christmas book from the library, so I reread this one from a few years ago. Although still entertaining, it didn't hold up very well to a second reading. Feeling really sad that I wasted so much of my year on this book. It wasn't bad, but it wasn't what I was hoping for either. I think I would have been totally intimidated by Julia Child in real life, but I sure loved reading her memoir. Contented sigh. I love this book. 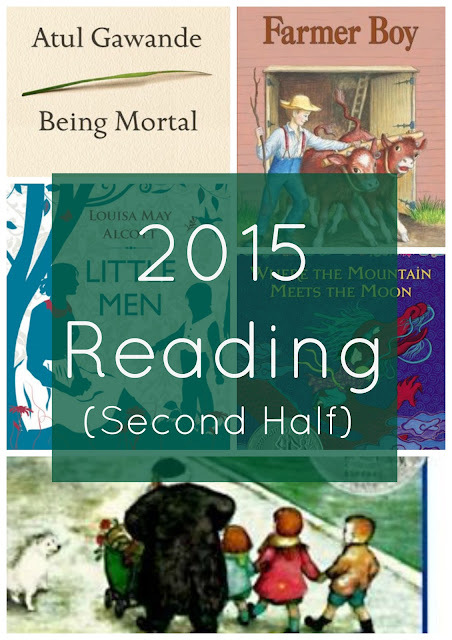 It has been such a great year of reading for me, and I hope you can say the same. Have you read any of these books? Tell me what you thought about them! So fun! I love your long lists so I can easily pull from only the greats! Which ones have you read? I'd love to hear your thoughts on them! Congrats on meeting all your reading goals! 68 is such an impressive number, and I love seeing them all in this list format with your star ratings. Are they listed in the chronological order you read them? More or less, yes. And thanks! It totally depends on what company I'm in whether I think 68 is a large number or a small number.